There’s no sense fooling ourselves: all indicators in the Church and in the state point to the rise of a new economic, political and social order that promises to be supremely hostile to all things Christian. That’s the reality, and there’s only one thing we can do to slow the “progress” upon which that reality depends: devote ourselves entirely to the restoration of Catholic social order. This begins, of course, with the universal restoration of the Traditional Mass—the touchstone of the Faith. Thankfully, there are many traditional Catholic priestly fraternities around the world doing just that. Many of them are “spin offs” from the Society of St. Pius X, but as the situation grows increasingly desperate, this shouldn’t be regarded as anything less than providential. It should be apparent to all by now that the era of partisan politics and bickering is over. Traditional Catholics have a duty before God to pool their resources, unite their forces, and set aside tactical differences of opinion in preparation for the coming purge of all things Catholic. In this brief calm before the inevitable storm, we must not allow ourselves to be distracted by anything that does not directly contribute to the advancement of the Catholic Restoration. We’re running out of time. Michael J. Matt (MJM): Many thanks for providing American Catholics with this opportunity to learn more about your apostolate. I had a chance to walk with one of your seminarians this past spring on the Pilgrimage to Chartres, and was impressed with what he said about the Institute. I’d like to ask you a few more questions for the benefit of our readers. In general, how are things progressing with respect to the growth and expansion of l’Institut du Bon Pasteur? Father Laguérie: The Institute of the Good Shepherd has been in existence for only two years. Even so, we have already had eleven ordinations to the priesthood, increasing the number of our priests to twenty-two. The Institute concentrates mainly on the sacerdotal formation of priests which ensures its future. 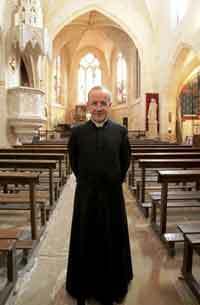 Also most of the Institute’s priests remain here in the Institute, even if some have Sunday ministries. In addition to the houses which existed already at the time of its creation in 2006 (the personal parish Saint-Éloi in Bordeaux and the cultural centre Saint-Paul in Paris), the Institute serves four other Mass centers in France: Rolleboise, Courtalain, Meaucé and Marseilles. Apart from France, it is also established in Rome where we have a house of formation, in Santiago, Chile, Bogota, Colombia and more recently Poland and Spain. This we believe is not so bad in two years! MJM: Indeed! In France, are you seeing more receptiveness among mainstream Catholics to your work and to the traditional Mass since the Holy Father’s motu proprio Summorum Pontificum? Father Laguérie: In France, the Motu Proprio of the Holy Father on the traditional liturgy did not really change the situation of the priests of the Institute (the “spécialisés”, as Cardinal Castrillon-Hoyos calls them) in the sense that the majority of the bishops prefer to use their own diocesan priests to respond to the many requests of the faithful who wish to have access to the traditional Mass. The bishops fear that allowing personal parishes to be served by priests celebrating only the traditional Mass (as the Institute priests do) would be divisive. At the moment, there are only two personal parishes of extraordinary form in France: Saint-Éloi in Bordeaux (my parish) and Saint-François of Paul to Toulon. This is not enough! The fears of the bishops are unjustified, as these two parishes demonstrate that it is quite possible for our apostolic work to be carried out without in any way causing problems for a local bishop. Personal parishes (where the traditional Mass is offered exclusively) are the solution of the future, as is so often the case in the USA, they are increasing in number here in old Europe, thanks to those American bishops who show a good example of how to comply with the spirit of Holy Father’s motu proprio! In Paris, I have presented to Cardinal Vingt-Trois 1,800 signatures of faithful Catholics asking for a personal parish served by the Good Shepherd. As of today, our requests have not been answered. MJM: And how would one go about getting an Institute priest to set up a Mass center in a given diocese? Father Laguérie: There is no canonical form which allows us to set up an apostolate in a diocese without the consent of the local bishop. This is part of the divine Constitution of the Church; and it is wise. Without such laws the Church would be ungovernable. But, nevertheless, it remains the pressing responsibility of bishops who, for curious reasons, hinder the progress or even deny admittance to an apostolate which could be extremely helpful to the souls of the faithful. Bishops who do this will have of account to God for it. The Motu-Proprio gave precise conditions for introduction in the extraordinary form of the Mass. But these conditions, barring recourse to the Commission Ecclesia Dei which is overloaded with requests for help, are not mandatory. We must negotiate with each bishop, meet with him, convince him and ensure him that our apostolate will be of benefit to his diocese. This is not always an easy thing to do. As Cardinal Ricard, Archbishop of Bordeaux, has said, it will take years for the anti-Traditionalist prejudice to change. But, then again, the episcopate is slowly being renewed, and we start to see young bishops coming up who, far to being hostile to Tradition, are rather favorable to it. MJM: What exactly is a Catholic society of apostolic life? Are you under a diocesan bishop, or do you answer directly to the Vatican? Father Laguérie: The Institute of Good Shepherd is an apostolic community of pontifical right. That is to say two things. That we are not religious (we don’t take vows), and we are not yet a Congregation of religious life but rather of the clergy, operating under the Pontifical Commission Ecclesia Dei. It wasn’t so long ago when Cardinal Castrillon-Hoyos was at the same time the Prefect of the Clergy and the President of the Commission. On the other hand, the Institute depends solely on Rome in its structure, its government, its laws. Recourse to the local ordinary, which has no direct say in the life of the Institute, is nevertheless necessary, as I said, when it comes to gaining entrance into a given diocese at the request of the faithful. The internal jurisdiction comes from Rome by the General Superior and the jurisdiction near a Catholic community still must be granted by the local ordinary. MJM: If I remember correctly, when the Institute was erected one of the conditions stipulated was that you would retain the right to offer constructive criticisms of the Second Vatican Council. Have you in fact managed to retain that right, and can you give us an example of how it was exercised in recent months? Father Laguérie: In addition to our “charism” when it comes to Liturgical matters (remarkable in that our statutes were set up before the Motu Proprio! ), the Institute is also characterized by a true doctrinal freedom, with respect to the doctrines and authority of the Church, to work out hermeneutics of continuity of the Second Vatican Council and a subsequent authentic interpretation. Of course such work has to be accomplished with respect to the ultimate authority on such matters, that is to say of the Pope. In this we follow the remarkable instructions of Pope Benoît XVI in his speech to the Curia of December 22, 2005. We try to reflect in the Church the considerable advances in a traditional interpretation of the Council which the Pope has already initiated. For example, the famous “subsistit in” of Gentium Lumen, the precise details brought by the Pontiff on the question of religious liberty, or the prerogatives of the one Church of Jesus-Christ and her radical differentiation with sects, etc. We are trying, by words and writings, to bring back a coherent understanding, very often abused, of the Catholic doctrines according to the continuity of tradition, and not according to the rupture caused by the false Spirit of the Council. It is a difficult job, and one that will not happen overnight. “Truth was reduced by the children of men” complained King David. This year of Saint Paul reminds us of the necessity of boldly preaching the traditional Faith. MJM: What would you say is the raison d’être of your apostolate? Father Laguérie: Our mission rises from clear precedents. Everywhere where doors will open, seminaries, parishes, colleges will open in this spirit of Catholic pride and the freedom to preach the Gospel. The time has come to restore to the Catholic Church, in the face of the most dangerous and insane extremism, the beautiful harmony and the sweetness of the teaching of Our Lord and Savior. MJM: Father, can you say something about the general state of affairs in the Church? Would you say the situation is improving for tradition-mined Catholics? Father Laguérie: It appears obvious to me that the years of “delirious” doctrine, liturgical experimentation, and pastoral recklessness are coming to an end, thanks be to God. Far away now are those dark days when a South American bishop was lighting his cigarettes during the Mass while explaining, with mitre on his head and cross in his hand, that the Mass is just a meal. Such scandals have become passé as Tradition rises up. The Holy Father’s continual call that the shepherds return to defend the sheep appears to be bearing fruit. Clergy, young families, the youth—they are more traditional than their fathers and mothers. But it is necessary to take care not to shout victory just yet, as if the crisis which shook the Church is over. It is not. The abandonment during the past 40 years of authentic Catholic Philosophy and Theology deeply rooted in the Church will continue to leave deep and disastrous traces for many years to come. Every single day, it is necessary to raise the walls of the City of God and even if the “darkest hours of our history” are behind us, nothing would be more disastrous than for us to believe the Church is at peace with the modern world. Every man must, said the Pope, “find his place in the Church”. We are still very far from the restoration of Christianity. MJM: Here in the States we see frightening statistics on the decline of the practice of the Faith in France—the “eldest daughter of the Church.” At the same time, the traditional Catholic movement in France seems stronger than ever. What explains this dichotomy? Father Laguérie: Your statistics on the decline of the Church in France are unfortunately exactly right. Forty years ago, 80 percent of the French were baptized Catholics; 50 percent were practicing; there were 1,700 ordinations per year. Today, hardly 35 percent are baptized, only 5 percent practice their faith, and there are less than 100 ordinations per year. When we ask the best of these about the level to which they still believe, it is even more alarming. The majority do not believe in the divinity of Christ (who, for many, is a vague prophet like Mahomet), neither do they believe in His Resurrection. Belief in the necessity of Faith and baptism for salvation has all but disappeared. There is little belief in eternal life but rather a “pious” notion that there might be something after death—an open unknown factor certainly not established on the word of Our Lord and the teaching of His Church. What explains the rise of Catholic Tradition in France? This has to do with personal prayer, I believe, and the rallying around good priests, who, though persecuted, teach them that Faith is preserved in the Catholic family with enormous price and sacrifice. It should be said that the crisis, liturgical in particular, was much more violent in France than elsewhere, excluding, perhaps, some countries like the Netherlands or Germany. Your readers know well that Msgr. Lefebvre was French and that the reaction and hope that he caused throughout the whole world was more strongly felt still in France. I would point out that the French are Gallic and that, while that may present difficulties day to day, it also is a powerful asset in the event of emergency and persecution and revolution. MJM: Pope Benedict has lamented the rise of a “dictatorship of relativism” in formerly Catholic Europe. In Canada, priests face prosecution for preaching the Gospel. In the United States, proposed “hate crime” legislation could make it illegal to reiterate Church teaching from the pulpit. What do you foresee in the future for priests who adhere to the Church’s teaching on Faith and Morals? Are they facing persecution? Father Laguérie: The priests of the immediate future will have to be, in America and elsewhere, heralds of Truth who do not fear to proclaim the Gospel even at great personal cost. “A time will come,” said the Apostle, “when men will no longer support sound doctrine”. We are there! It is thus imperative to preach the Catholic Faith. The bishops and the Pope himself will not be spared what is coming. We have to think of the example given by the Pope when he administered Baptism recently to a Moslem. It is necessary that the Church restore her pride and identity to all her members. We hear much today of the pride of the “gays”! Vice is enshrined, but now more than ever the Church commands us to announce the Gospel in all its force to a world so deceived by the powers of darkness. This is impossible if we do not have pride in who and what we are as Catholics. The universal preaching of the rights of man has spiritually bankrupted the world. It is vital that Christians, despite the diabolical disorientation, relearn the power of the real Gospel. And, of course, charity is at the heart of this. MJM: On last year’s Pilgrimage to Chartres, a priest very friendly to your Institute told me that, in his opinion, the Institute of the Good Shepherd is somewhat unique in that it has permission to offer the traditional Latin Mass exclusively and can’t be pressured to offer the New Mass for any reason. Is this, in fact, the case? Father Laguérie: Indeed the Institute has something special within the Catholic Church: We have two aspects of our mission: doctrinal and liturgical. Restore traditional doctrine and restore traditional liturgy. And this, with Vatican authorization and support. Our most cherished wish is obviously that these prerogatives not remain only the prerogatives of the Institute of the Good Shepherd but that they spread throughout the Church. Even if this is quite difficult to accomplish universally for now, it will become ordinary in a few years. Nothing and nobody can force our priests to celebrate the ordinary form of the Mass, not only since the Motu Proprio, but also before. Our priests are bound by the law of obedience to celebrate the traditional Mass. Those who would make the celebration of the ordinary form of Mass part of a condition for ecclesiastical communion, even from a simple pastoral point of view do now know Catholic theology. Let us pray that the ostracism of those of us totally dedicated to the traditional Mass, in Europe especially, will begin to fade away for the greatest common good. MJM: One of your critics recently suggested that the Institute of the Good Shepherd has permission to offer the Mass and Sacraments according to the 1962 Missal but only inside its own four walls and not outside. Is this true? Father Laguérie: The Institute is committed (not only authorized) to celebrate all the sacraments, not only the Mass, according to the liturgical books of 1962. Consequently, any ministry of ours will have to satisfy this requirement. We will not go anywhere where we might be expected to violate this requirement. MJM: I recently had an opportunity to speak to Cardinal Castrillon Hoyos. At that time, I asked him if, as a journalist, I should use the word “schism” with respect to the Society of St. Pius X. His answer: “No, schism is not the word. Theirs is an irregular canonical status.” Would you agree with His Eminence on this question? Father Laguérie: Like Cardinal Castrillon-Hoyos, I would never suggest the Society of Saint Pius X is schismatic! And not only for reasons of friendship which definitively connect me to the Society (I was with the SSPX for 25 years of my priesthood) but especially for theological reasons. A schismatic is not one who merely disobeys. A schismatic disputes the authority of the Pope in principle. It can never be repeated too many times: schism goes against the theological virtue of Charity and not against the moral virtue of obedience. It is thus that the true schismatic inevitably comes to profess an error against the Faith: a denial of authority in the Church and mainly that of the Roman Pontiff. Such is obviously not the position of the Society of Saint Pius X! MJM: So, let me ask you a similar question: As a Catholic newspaper editor living in extremely anti-Catholic times, I’m always looking for ways to unify tradition-minded Catholics against the common enemies of our Faith. I suspect that tactical differences between the Institute and the Society of St. Pius X still exist, but can you nevertheless assure American Catholics that the Institute has its own charism and its own mission, and that it was not set up as an instrument to undermine the Society of St. Pius X? Father Laguérie: Far from a trap (set by whom? I would ask) to lure the Society of Saint Pius X, the Institute of the Good Shepherd could be spoken of rather as a “test”. The Society of Saint Pius X must know instinctively that it will be treated tomorrow as we are treated today. In this respect, there is nothing to say that it is necessarily even desirable for the SSPX to sign some sort of agreement immediately. That is a matter left to the prudence of its superiors. If they consulted me, however, I would offer them the following counsel: Wait until we have ten personal parishes; delay until there is some proof that they will have tomorrow what we hope to have today. My fear is that doctrinal discussions with Rome will bog down, whereas step by step negotiating of a practical agreement will lead to a fertile apostolate that can then defend sound doctrine throughout the Church. MJM: And leadership? Do you anticipate a time when the Holy Father would grant traditionalist orders their own bishop—a man from their own ranks? Father Laguérie: The appointment of bishops is the prerogative of the Pope. The faithful are obliged to accept the bishops he appoints! But obviously, if a traditionalist bishop were appointed, I would applaud with two hands. There would be no chance then for a return to business as usual. MJM: Can you offer a couple of suggestions for how American Catholics can assist your apostolate, either financially or in some other way? And, if a young man were interested in joining the Institute what would the requirements be and how would he go about applying? Father Laguérie: Yes, we would call upon the well-known generosity of American Catholics when a bishop of their country invites us to come into his diocese, which is quite possible with some bishops. For now, the faithful who want to contribute or learn more about us can do it through the following email :instituteofthegoodshepherd@gmail.com. Don Hugues Beaugrand, one of our members currently in Rome is my assistant for the USA and he is available for everyone. For possible vocations, we require an aptitude, graduation and, of course, a sound prayer life. MJM: And young ladies? Are there any plans to set up a convent or religious house for women that would be affiliated with the Institute? Father Laguérie There are already some women vocations in the Institute. These nuns are dedicated to an apostolic life (and noncontemplative), adapted to our time and in the spirit of the sisters of Charity of Saint Vincent de Paul. To join them or to learn more about their vocation, women can contact Father Forestier in our seminary of Courtalain. MJM: Many thanks, Father. May God bless your most important work of Catholic restoration. Father Laguérie: I thank you for your splendid work for the Catholic Faith, and I present my best wishes to you; My blessing to all your readers united to us in love of Our Lord Jesus Christ.